One really nice thing that I had seen but didn't mention as it didn't fit easily in the original post, and that is the grounded iceberg Stef highlights. This is iceberg A23a, which is ~3,800 km2! 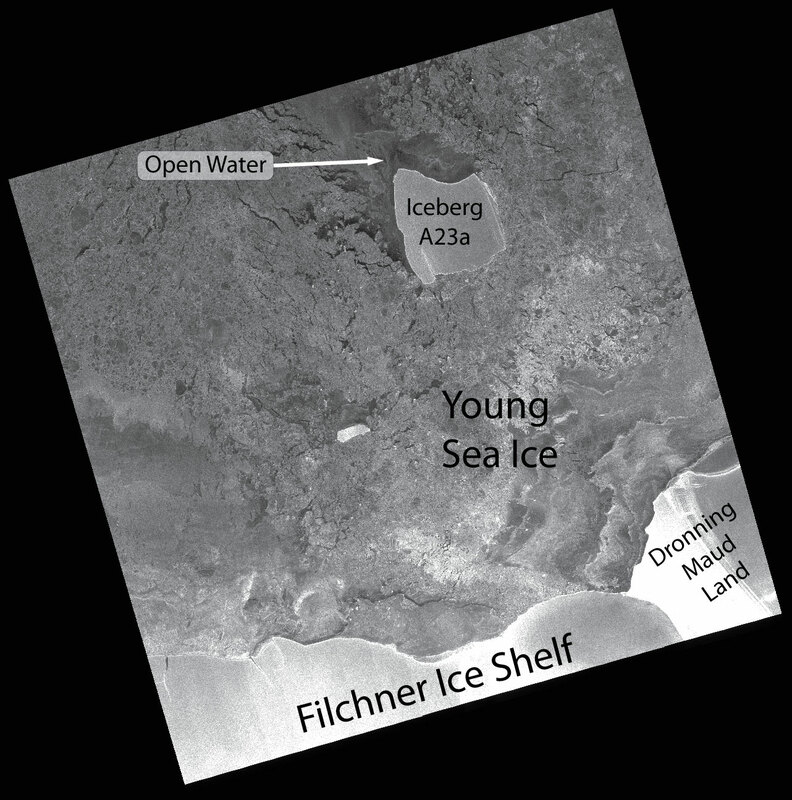 A23 was formed in August 1986 from the Filchner Ice Shelf Front, and at formation it had an area of ~3,850 km2, and was ~5-600 m thick (Grosfeld et al, 2001). So in 31 years it has only moved ~200 km mainly because it has been (and currently is) grounded (that is stuck on the sea floor). In that time it has lost ~50 km2 of its area. 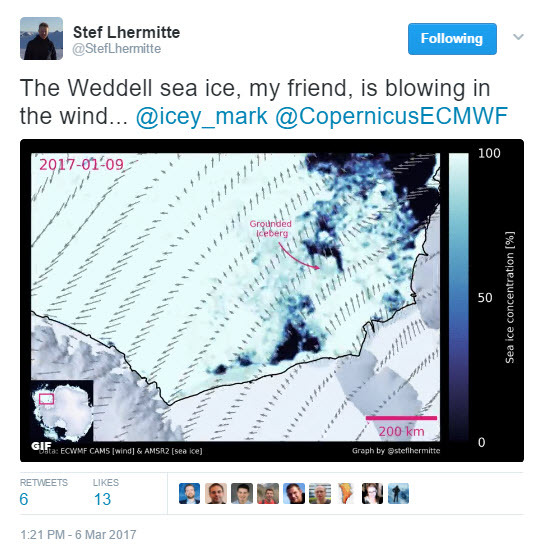 You can download from Polarview, a Sentinel-1 SAR image that was aquired on 6 March 2017 (01:01:06). I've labelled it so you can see the A23a. From PolarView: Sentinel-1 SAR imagery acquired: 06-03-2017 01:01:06. A23a is about 75% the size the iceberg that will soon break from Larsen C, although I would be surprised if that coming iceberg will last as long as this one because it is so much further north and closer to the open ocean. 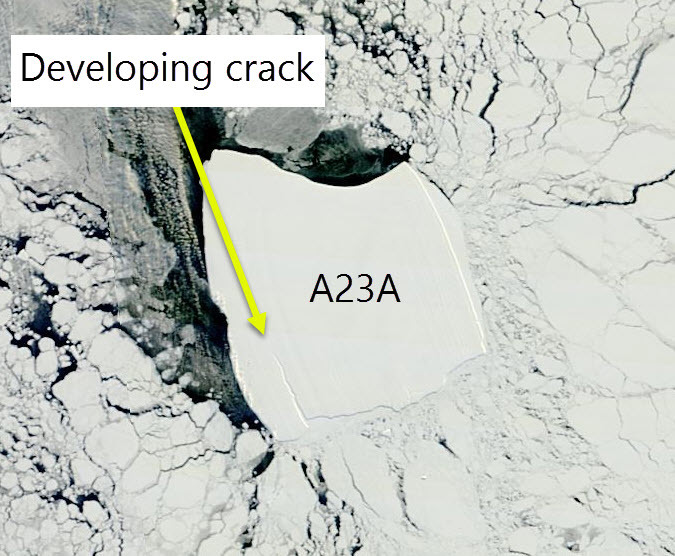 You can see very clearly in the Terra MODIS imagery from 5th March that A23a a fracture is developing across the iceberg. Iceberg A23a in Terra MODIS imagery 5th March 2017. It is undeniably vast and the broadcaster Matt Teller posted this over a year ago. The Antarctic summer is ending now and although this year is clearly unusual in the satellite record, we should expect the polynya to freeze over as winter develops. 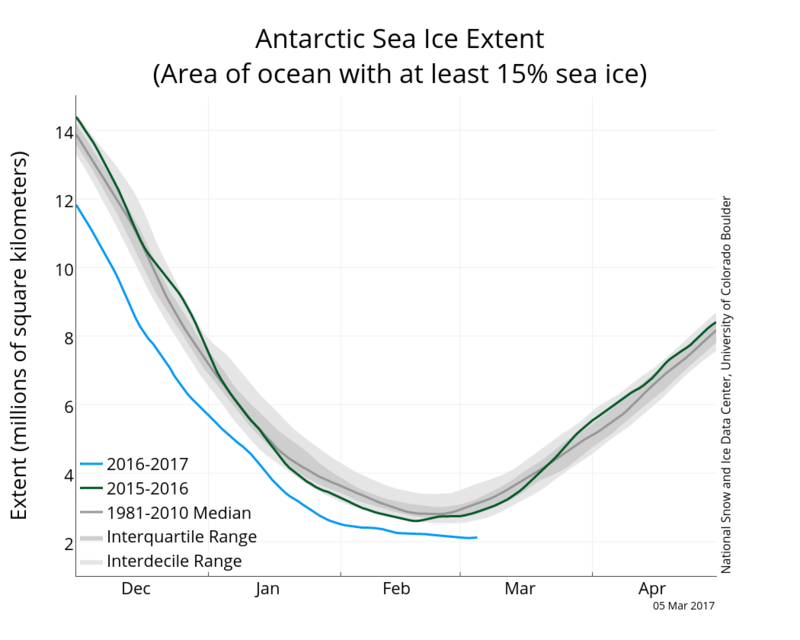 Antarctic sea ice extent (with greater >15% sea ice cover) 7 March 2017. From NSIDC. I would expect A32a to be around for many more years.